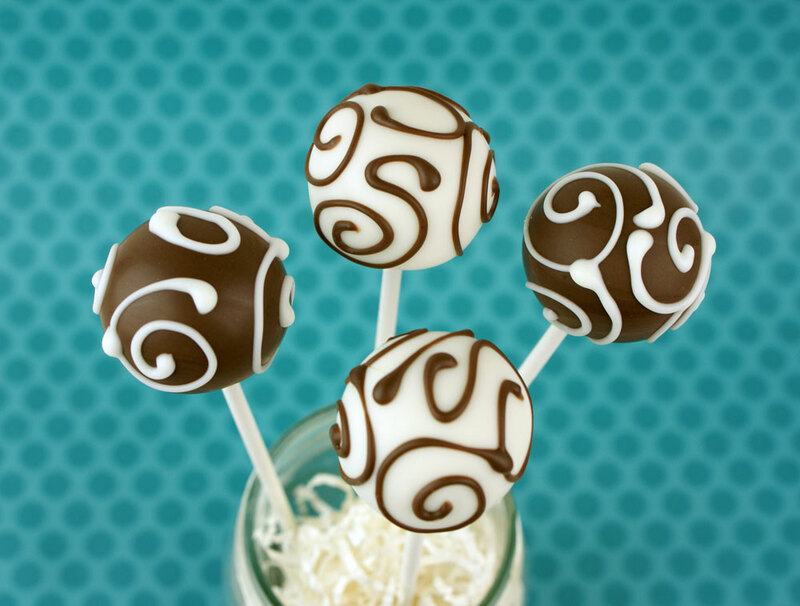 Cracks, air bubbles, leaks, and unsightly bumps can happen to any cake pop artist. 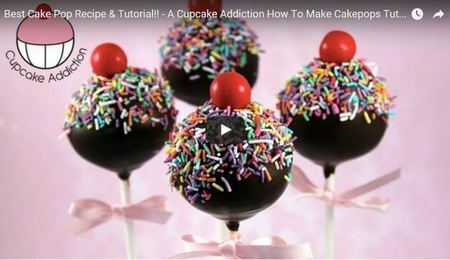 Learn how to make cake pops and troubleshoot the most common cake pop problems with this step by step tutorial. 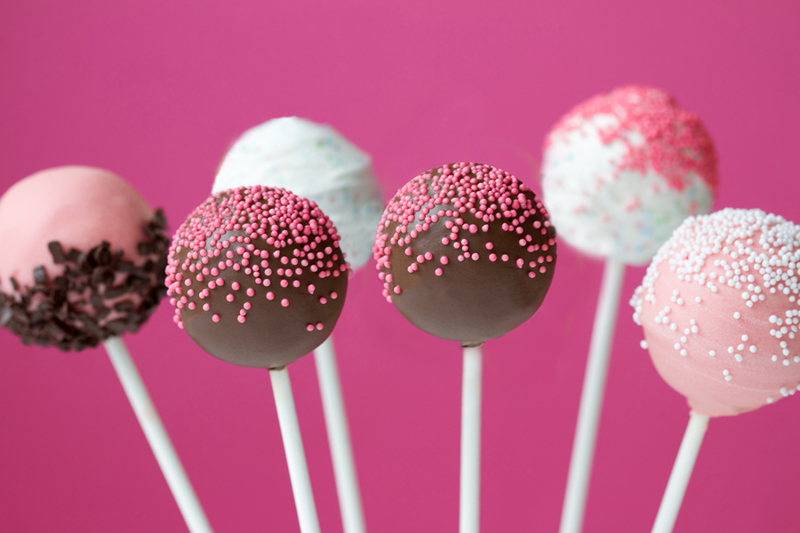 Have you made cake pops? Were they a complete disaster? Yeah, me too. Seriously. We’ve all burned the heck out of our chocolate, lost a cake ball off the stick, had our perfectly good cake pops crack 5 minutes later and begin leaking weird stuff out everywhere! It’s sooo frustrating! Don’t worry though, it gets better. But let me save you some time and sugar with a few tips…! Prepare and bake cake mix as directed on box. Allow to cool slightly – I leave it to sit about 30 minutes (longer if I’m not in a hurry). Crumble (trimmed*) cake into a large bowl. Add frosting and mix thoroughly with hands. 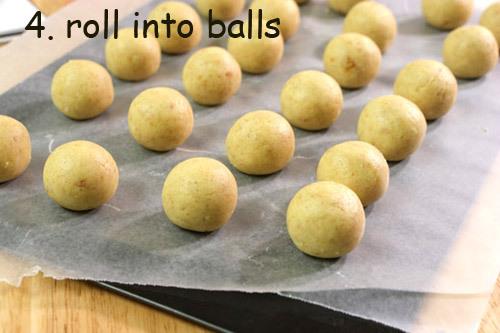 Measure cake mixture and roll into 1″ sized balls. Place on a wax paper lined baking sheet. 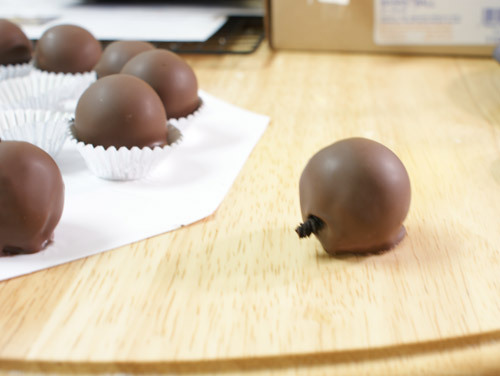 You may need to place the cake balls back in the fridge for 20-30 minutes, allowing them to firm up. Melt CANDIQUIK according to directions on package, being careful not to overheat. If desired, add oil or powder based food coloring; stir until blended. 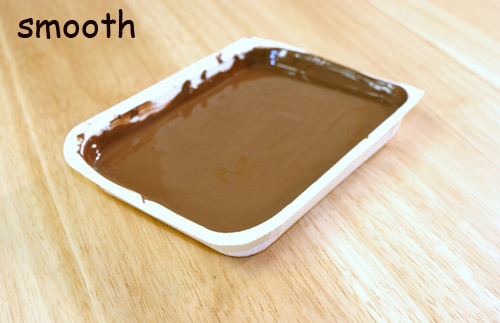 To Dip: you can use the tray that the coating comes packaged in, or a deeper microwaveable bowl if desired. 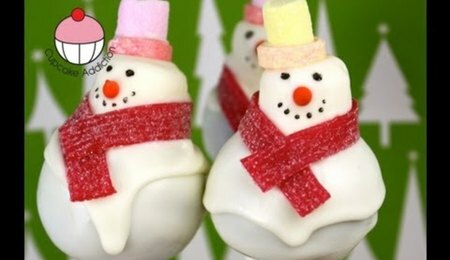 Dip cake pops in melted CANDIQUIK; allow excess coating to drip off (hold at a ~30 degree angle allowing the coating to drip off the bottom and not land on the stick) by tapping the stick and place in the Styrofoam block to set. Common Issues & Problems with Cake Pops!! MY CAKE BALLS/POPS ARE NOT SMOOTH! This is probably the easiest problem to fix. It begins with baking your cake. Do not overbake – simple. Second, trim off the edges and (if your obsessed like I am) leave the bottom of the cake out too. Mix thoroughly with frosting. Thoroughly, as in: dig in(!) 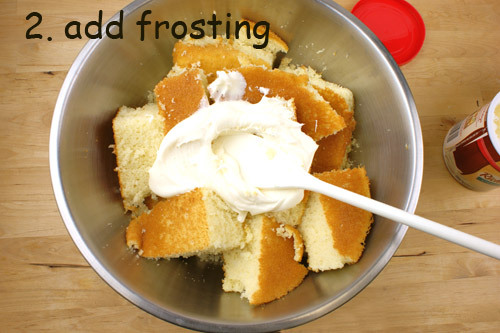 using your clean hands to mush the mixture of the cake and frosting together. Finally, roll, roll, roll. 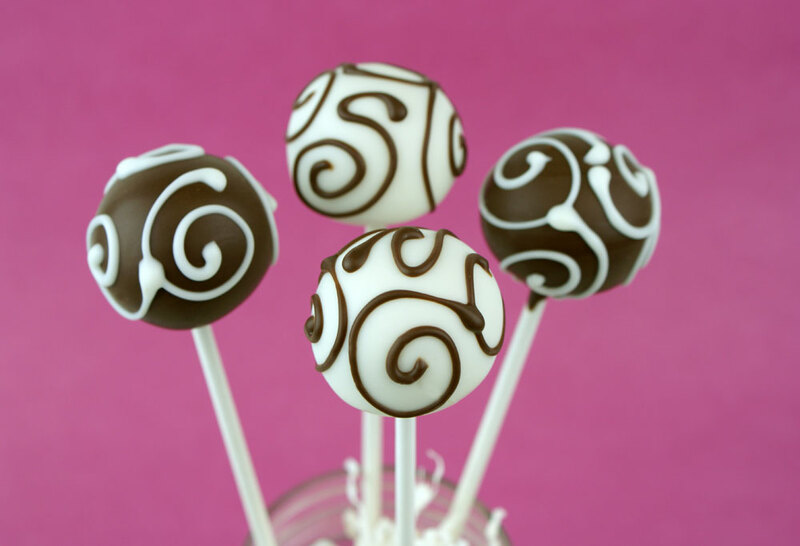 The smoother they look as uncoated cake balls, the better they will look when dipped. Voila. They look perfectly fine, then magically they look like they experienced an earthquake. Super frustrating! Typically, this is caused by the drastic difference in temperature of the coating and the cake ball itself – the coating is super hot and the cake balls are too cold; the cake ball expands and now you have cracks. While I do like to chill my cake pops in the fridge (sometimes freezer for a few minutes, but be careful – there is a fine line between keeping them firm to ensure they stay on the stick and too cold where they crack), make sure you pull them out before dipping and that your candy coating isn’t TOO hot (let it sit for a couple minutes after immediately heating). Think of it this way, you want to dip your cake pop in the warmest (while still being cool) condition you can, before it begins to soften and fall off the stick. This is the biggest challenge I have found with other cake poppers, sometimes – even with the perfect conditions – cracks happen. My Cake Pops are LEAKING CAKE/OIL! Some call it cake pop *poop* – which I think is a good word for it. After all, this was my initial reaction for it when I began making cake pops a couple years ago. This happens when the cake is pushing it’s way out of the coating through a weak spot, a tiny hole, or a bubble that resulted in a hole. Make sure you coat the entire cake ball in coating. Can also be caused by the cake ball and coating temperature difference – see the “cracks” problem. But in my opinion, leakage is better than cracks, so if you have a leak – pull the excess cake off and use a toothpick to seal up the hole with additional coating (luckily they usually occur near the stick/bottom so it shouldn’t be too obvious). The cake can also be very oily, causing oils to seep out the coating and even down the lollipop stick. If this happens, remember, you can always substitute apple sauce or greek yogurt for oil in your cake recipe! Also, using less frosting = less oil. And again, you can seal any holes up with a little candy coating. Despite all of that, I still have some cake pops that are oily and the stick literally absorbs the oil (could be the cake flavor/mix) and I’m fine with it, as long as they don’t crack/leak! Colored lollipop sticks would help hide any oil absorbed (these can be purchased online or at specialty cake supply stores). Air bubbles happen. You can prevent this a lot of the time. Usually caused by stirring your chocolate too fast/vigorously. 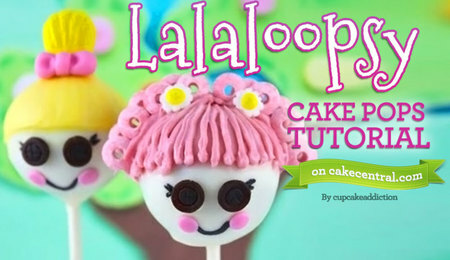 Create a smooth “spot” with the back of your spoon before dipping your cake pop, it helps drastically! 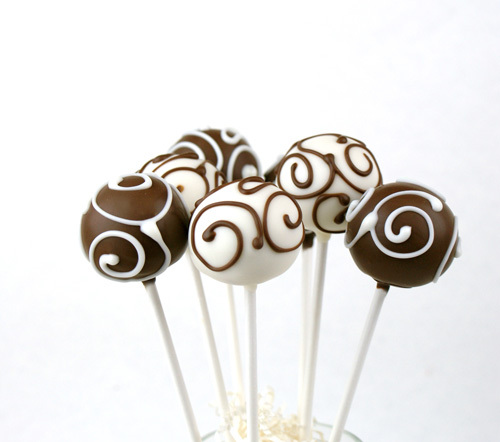 Just run your spoon (in a back and forth motion) over the coating between dipping each cake pop. 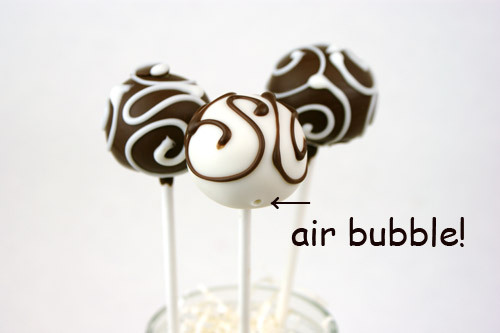 If you notice the air bubble immediately upon pulling your cake pop out of the coating, just give it a second dip. My coating is THICK & CLUMPY! You may have scorched your coating. This is a very common issue and happens when the sugar particles become too hot, causing them to carmelize or scorch. When using the microwave, be sure to follow the instructions and heat the entire block of CandiQuik for an initial 60 seconds, then stir very well and heat in 15 second intervals. If using less, adjust the microwave times accordingly. And remember, you can’t go backwards if you scorch your coating, so it’s better to start off slow. Of course, microwaves can heat unevenly and cause hot spots, so stirring constantly in between heating and using short intervals will help this. If melting on the stovetop, make sure you have the burner on low heat and stir constantly. And of course, I suggest using CandiQuik Candy Coatings. I don’t have to add anything to thin it out and I get a nice, smooth, palatable, thin shell of coating (versus a thick, gloppy mouth full of thick sugar particles). *If you experience the coating is thicker than normal (commonly caused by humidity/climate), add a teaspoon-tablespoon of solid vegetable shortening (ex: Crisco) or vegetable oil to the melted (16 oz) coating. Begin by adding a little and add more if needed. *Also, if you see just a tiny section that has burned/scorched/became too hot, I have been able to save the rest of the coating by carefully scooping out all of the coating that was burned! Simply spoon it out and allow the rest of the coating to cool slightly, then continue heating in short time intervals. This is usually a microwave heating the coating unevenly. This can happen because of a few problems. I think the most common is thick coating and it is dragging your cake pop down. Again, smooth coating is one of the most (if not THE most) important parts of successful cake pops! Also, huge cake balls are heavy cake balls. So try to make them moderate size (1″ tall), use a spoon (small cookie dough scoop, coffee scoop, melon baller) or something to measure an even amount for each ball. Also, when I first started making cake balls I would use the whole can (16 oz) of frosting. Now, I start with adding 1/3 of the can and typically use up to 1/2 (8 oz) of frosting. You could probably get away with even less than that, but I found this amount is good for me and rolls out smooth. Also, when dipping your cake pops: dip the stick in the coating first, then insert into the cake ball. Then, when dipping the cake pop make sure that you don’t bump the bottom of the cake ball on the bowl. Finally, don’t swirl the cake pop around in the coating, just dip and get out! Thank you for the tutorial! Your pops are beautiful! I have tried cake pops a handful of times and have had varying degrees of success..and figured I'd never get the hang of it. These tips will be helpful and I"m encouraged to give them another try. I know that a big problem I had was adding too much frosting..the whole can was way too much..and I didn't roll my balls smooth enough, for sure. Thanks again for taking the time to make this tutorial! Lovely tutorial. Thank you so much for answering all my questions BEFORE I had to ask them! Thanks, definitely going to try this. I bought one of the pans to make the perfectly round balls without adding frosting to the cake and form them yourself. I was so excited waiting for it to get here! It came a few days before Christmas, and I haven't touched it yet. I bake all the time, but I had some doubts after the thing arrived, now I feel I can tackle these babies!! Thanks for the info!! FANTASTIC tutorial!!! thank you, thank you, thank you!!! I have experienced almost every one of the problems you describe, and I had not figured out how to solve the cracking! Looks like there will be cake pops made at my house this weekend! yeay! 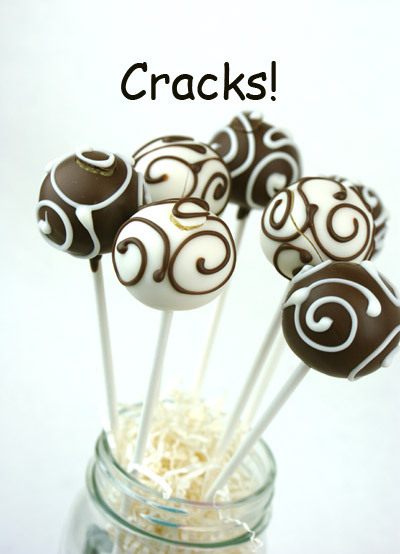 Thank you for this tutorial, I've had problems making these especially cracks, until my hubby bought me the baby cakes cake pop maker, but this troubleshooting is so helpful I just might try doing them again. Love this tutorial. Thanks! I've never tried cake balls before, but my daughter is constantly asking me to make some. Maybe with this tutorial by my side, I'll have a little more than just "beginners luck'. Thanks so much for all your info. Can't wait to try them again using this info. How can far in advance can you make them, and how do you store cake pops which are wrapped in a clear baggie? Cake pops are my downfall. Can do all kinds of beautiful cakes but the pops are never a success for me. I will try all your tips. One question though: do I have to use canned frosting, is that necessary for success. I hate canned frosting and would prefer to use my own homemade frosting. Awesome tutorial....so detailed. Thank you for sharing. Flourbud, my wedding cake instructor made cake pops for brides using any trimmings from her wedding cake, he didn't use any frosting. One of the purposes of the frosting is to help keep the cake ball stay together, and to add another flavor element, but if your cake is moist enough you don't need the frosting. My instructor would just use flavored sugar syrups or liquors keeping with the same flavors in the wedding cake adding the necessary moisture to the cake. The flavor options are endless! This is awesome! I had the leaking "oil" problem on some cake pops I made a few weeks ago - appreciate the advice! Thank you so much for the details! I tried last summer for a surprise party, and failed to the point of tears lol.... with the falling off the stick (red velvet was just too moist and heavy) and then the cracks. I think I just may try again in a smaller scale just to hope the tips work! I tried them using white chocolate. But white chocolate was stiff and hard to dip even with the addition of shortening. They did not come out smooth enough. Does the brand or quality of white chocolate make a deifference to melting. If so can you recommend a good one. Also I found them waaay too sweet. Are candy melts less sweet than white chocolate? Thank you!!! Excellent tutorial! I have gone through several of these issues myself at different times, especially with the candy melt or chocolate. I finally purchased Merckens chocolate coatings and this has worked great for me. One question though, should the pops be refrigerated when done? or can they be left out at room temperature, what do you recommend? and again Thanks for sharing!!! Just an FYI for those that don't want to use canned frosting...or any frosting in your cake balls. This was our biggest seller at the bakery I worked for and we just used cake that we had smooshed down and kneaded until it was the consistency of cookie dough (it can take a bit of effort but keep kneading and it will turn into dough). It makes for a less sweet cake ball, but very rich. We also used meatballers to portion and then roll smooth by hand. I don't make them because I never could get the hang of dipping and having them look as beautiful as these. I will have to try these tips on my next batch of left-over cake scraps! Oh... and to address I question I just saw...the bakery left the coated cake balls unrefrigerated. Thanks for the great info!!! I was wondering why I sometimes got the cracks!! Great Tutorial! I have been making Cake Pops for a long time, and these are some additional tips for perfect results: 1. 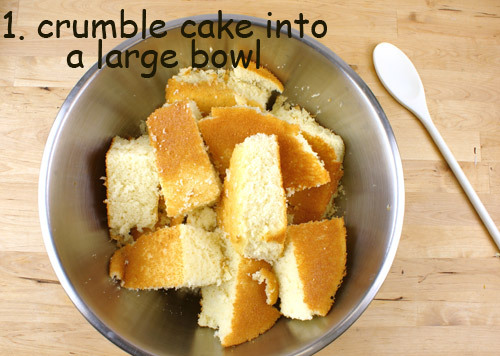 Do not add frosting to the cake crumbs- this causes the cake to crack and uneven results. Instead, Crumble cooled cake (I use the entire cake) with a FOOD PROCESSOR and the plastic blade. The mixture will be perfectly smooth and adhere together without adding frosting. It still is delicious WITHOUT the added frosting. 2. Candy Melts are frustrating to use because the consistency changes very quickly, as they cool. Even thinning the consistency with vegetable oil or shortening has limitations. I used an electric Candy Melting pot with continual heating and still had difficulty dipping my cake pops. 3. 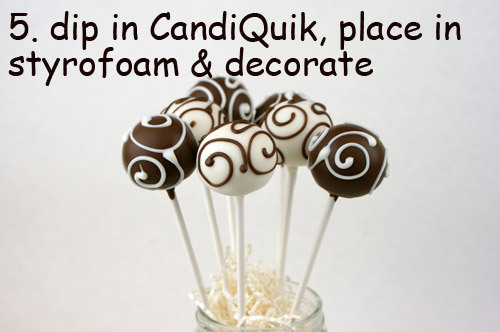 Candiquick stays "liquid" longer than candy Melts and is easier to use. If you can keep the coating continually warm(electric melting machine, warming tray, etc) the dipping process goes much faster. 4. I use a 1" retractable "ice cream" scooper(disher) and form all the balls before melting the Candyquick. 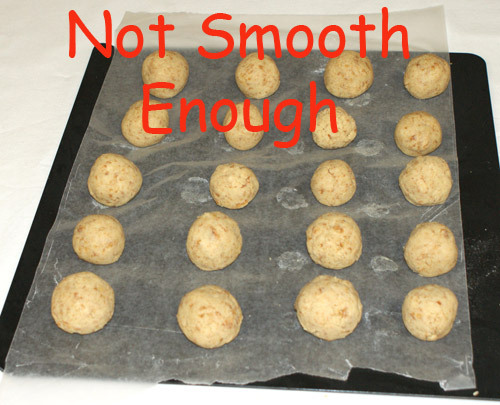 I put the formed cake balls on a parchment lined cookie sheet with sides, and set into freezer while I melt candyquick. 5. Make sure to anchor the styrofoam with something heavy BEFORE adding freshly dipped pops. The styrofoam WILL tip from the weight of the cake pops if you do not do this!! 5. Put the sticks in all the cake balls and let them chill in the fridge. I dip the sticks individually in candyquick and center in cake balls. I leave them on cookie sheet in fridge, to chill and set up. I hope this helps and you get PERFECT cake balls everytime!!! This is so perfect ! I never thought to cut off the sides and bottom ! Thanks !! I use my small rice cooker as a double boiler. I put water in the bowl that you cook the rice in , then I have a small metal bowl that fits perfectly inside it - I heat up the water on cook, then switch it to the warm setting and it keeps the candy coating at the right temperature for dipping. Thanks so much for the info, it is great. I always use the cake pop maker. I always thought it would taste kind of gummy and too sweet your way. But I think I'll give your way a try. Thanks again. This was a real helpful post. thanks! Thank you, very helpful.I have problems with the stick coming out and the cake ball falling in. I'm having problems to melt chocolate, white chocolate and candy melts for cake pops, do not melt. I am following the instructions but does not melt.